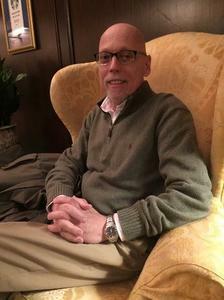 John Russell Awrey, age 62 of Holland/West Branch, MI, passed away on December 17, 2018 in Grand Rapids MI, due to complications from lymphoma cancer. John was born in West Branch to Esther and Russell “Hutch” Awrey on 8/9/1956. Growing up, John worked in his father’s restaurant, Hutch’s Place, that later became Mac’s Place. John graduated from Ogemaw Heights High School, class of 74’. John traveled to the Philippines as a pianist performing in concert with The Wagner’s. He was devout follower of Jesus Christ, spending his years as a member of the Ogemaw Hills Free Methodist Church. John was the music director, and praise band leader for many years using his gifts as a pianist and organist during worship service. John also directed and organized the Christmas Cantata for many years. John became a member of the Pillar Church of Holland, and recently became a Benedictine Oblate of Saint Meinrad Archabbey. John attended Vennard College, Albion College, and Kirtland Community College. He spent his working career as The Equalization Director for Ogemaw and Arenac Counties. John wrote text book chapters for college level publications, and enjoyed teaching and instructing at the college level. John built several homes himself, completing construction from the ground up. John enjoyed performing music as a pianist, sailing, motor cycle riding, writing, and walking on the beach. John was preceded in death by his parents Russell “Hutch” and Esther Awrey, and sister Donna Lee Awrey. He is survived by his wife Cindy Awrey; daughter, Elizabeth Palm; son, Joshua Awrey; grandchildren, Carter Palm, Kadence Palm; sisters, Nancy Noel, Shirley O’Neal-Moriarty, Silvia Du Fresne; and former wife, Nanette Sorenson. A funeral service will take place on Friday, December 21 at 11:00am at First Reformed Church 630 State Street in Holland, with a one-hour visitation prior to the service with Rev. Jon Brown officiating. A private burial will take place at Lakewood Cemetery.